(NaturalNews) Oregonians are about to find themselves living in a bona fide medical police state if State Sen. Elizabeth Steiner Hayward gets her way. She's spearheading changes to state law that would eliminate philosophical and religious exemptions for vaccines, thereby forcing all parents to have their children physically violated with extremely toxic substances still used in vaccines: mercury, aluminum, formaldehyde and monosodium glutamate -- all still used in vaccines as openly admitted by the CDC. Nazi fascism is deeply rooted in the belief that the state owns your body -- a belief now shared by Sen. Steiner Hayward. Under the banner of "science," Nazi scientists readily endorsed all the following "medical science" policies while claiming they were all necessary for the "greater good of society." See Nazi public health propaganda posters here. All of these wildly unethical, human-rights-violating programs were spearhead by people who invoked the exact same logic and abandonment of morality now demonstrated by Sen. Elizabeth Steiner Hayward. She is not just willing to skirt the boundaries of medical ethics and human rights, she is thrilled to obliterate that line in her zeal to achieve a government-enforced medical dictatorship over your private body. Once that line is destroyed, there's no stopping where it goes: mandatory organ harvesting "for the greater good." Mandatory abortions of genetically "inferior" babies (with forced government DNA testing of your baby required by law). Government revocation of your reproductive "rights" if your own health does not meet the government's strict standards. (GATTACA) Oregon state death panels that demand everyone be euthanized at age 65 to save the state money on Medicaid... there's no end to the horrors of a government that has zero respect for human dignity and medical freedom. If you've ever wondered how a group of the world's most brilliant scientists once marched the world's most scientifically advanced nation (Germany) down the path of genocide and mass death, look no further than the schemes and words of Oregon state Sen. Elizabeth Steiner Hayward. She is the poster child for the kind of medical tyranny that has already lead straight to genocide once before in human history. Who will take a stand and stop Steiner Hayward from repeating that dark chapter of history with the citizens of the state of Oregon? What's most astonishing to me is to think back about how many courageous American men and women lost their lives in World War II in order to defeat Nazi tyranny and bring down a government regime that has spiraled out of control, placing everyone's liberty and safety at risk. Now people like Steiner Hayward are frantically trying to bring back that same tyranny -- and she's in a position of power to make it happen unless the People of Oregon stop her. Not only should Steiner Hayward's medical police state actions be utterly rejected by the public; she should be recalled from public office by the People of Oregon for daring to pursue the agenda of quack science vaccine lunatics who are nothing short of mentally ill for wanting to physically violate the bodies of children with the toxic chemicals still used in vaccines today. 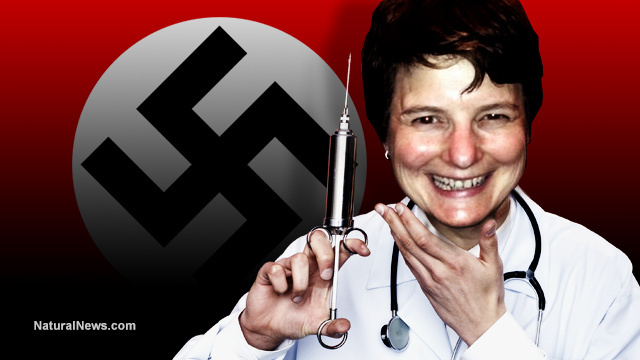 Tell this out-of-control Oregon legislator to keep her needles away from our children! It's time to let your voice be heard and tell these tyrannical, out-of-control legislators to keep their needles away from our children! The public is fed up with medical tyranny, and both the entire medical profession and the mainstream media have lost tremendous credibility over this contrived, wholly fabricated vaccine propaganda scheme. 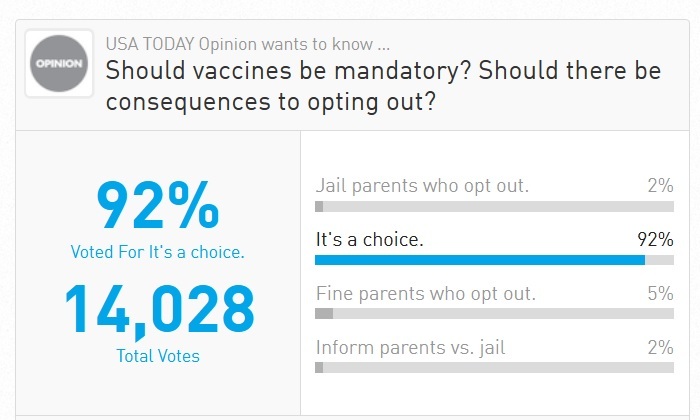 Even USA Today, which recently published a column calling for the arrest and imprisonment of "anti... recently hosted a public poll asking whether Americans should be forced to be vaccinated against their will. Even the American Medical Association is openly opposed to mandatory vac.... Its own Code of Ethics guidelines clearly establish the principle of "informed consent" for all medical procedures, stating that doctors who fail to respect their patients' decisions are operating in total violation of established medical ethics. It is astonishing that Sen. Steiner Hayward now wants to make the violation of the AMA's medical ethics a routine feature of Oregon state law!